The cover of "Challenger: An American Tragedy" written by veteran NASA public affairs office Hugh Harris. Twenty-eight years ago today, NASA and the world watch as the space shuttle Challenger and its crew of seven intrepid astronauts were lost shortly after liftoff in a devastating launch failure. 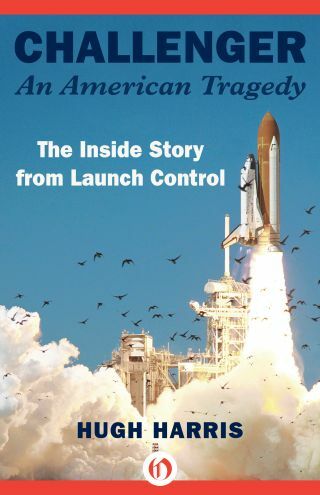 The Challenger shuttle disaster, tragically, was not NASA's last shuttle accident, but it was the first broadcast on live television and is the subject of the new e-book "Challenger: An American Tragedy" by veteran Hugh Harris, who served as the Voice of NASA in launch control. In the book, Harris offers a personal — and sometimes painful — look back at one of the darkest chapters in U.S. human spaceflight, as well as its impact on NASA over time. Veteran Hugh Harris, author of the e-book "Challenger: An American Tragedy." Challenger was a spacecraft designed to transport, protect, and nurture its seven-member crew as it transported them beyond the limits of our home planet’s life-support system. There, they would conduct experiments to improve lives on Earth. Among its passengers was the first civilian crewmember, the “Teacher in Space” Sharon Christa McAuliffe (known as Christa), who was already inspiring a generation of school children. I had watched from the firing room as the twenty-four previous shuttles rocketed upward and successfully returned to Earth. But on January 28, 1986, Challenger was engulfed in a fiery inferno in full view of thousands of people at the center and millions of others viewing the launch on television. For some young astronauts, it was a “loss of innocence” that took some time to accept. Franklin Chang-Díaz flew on STS-61C, the shuttle mission just a few weeks before Challenger. He and his crew experienced the tragedy from a viewing room at the Johnson Space Center in Houston. The accident triggered in-depth investigations and denied the nation of human access to space for almost three years. Unmanned launches continued, but our astronauts stayed on the ground. It brought into question the way management and technical experts worked together. It highlighted the role played by political decisions and uncertain year-to-year funding. It exposed the roadblocks to communication imposed by managers and organizational culture. It was a chilling reminder that it is safer to sit on the ground than fly into space. But that’s not an option for the human race. Ultimately, it helped enable 110 more space-shuttle flights and the construction of the International Space Station, which ranks near the top of human achievement. Dozens of people gave the “go” to launch on that morning twenty-eight years ago, and tens of thousands more had worked on the hardware. Yet, despite all of the investigative probing and some rancorous finger-pointing in the months to follow, no one ever alleged less than a strong desire to do his or her job to the best of his or her ability. It demonstrated, once again, how much there is to learn as humankind continues to advance the boundaries of science, technology, and human interaction. On that day, I was the chief of public information for NASA’s Kennedy Space Center and the launch commentator. This piece will take you on the same journey I experienced in the hours before launch and then along the bumpy road to find the cause of the accident and heal the system. The night of January 28, 1986, was the coldest I can remember in Florida. But when I left my house in Cocoa Beach at two a.m., I wasn’t thinking of the cold. I was worrying about getting to the Kennedy Space Center on time. Every time I served as “the voice of launch control” for a space shuttle launch—a responsibility I had held beginning with STS-1 in 1981—I worried that my car would be delayed by the hundreds of thousands of people who came to watch. If I didn’t get to the firing room on time, the launch would have happened anyway, but I would have felt like I’d let down the team. But this morning, as I drove toward KSC, I did not find the usual congregation of cars. Very few were parked along the causeway over the Banana River. Normally, even at that early hour in the morning, and eight or more hours before a launch, the causeways were crowded. Families would leave their cars to make new friends or gather around radios to keep track of the progress of launch preparations. Cars would sport license plates from dozens of states—California, Washington, even Alaska. The space program was a source of national pride, and we who were privileged to work in it could not help but be inspired. But this night was different. The few who had come were huddled inside their vehicles. In the distance, Pad 39 B and Challenger were sparkling in the pure white light of the xenon searchlights. The thick shafts of light illuminated the rocket vehicle and slanted skyward for many miles. As I drove toward the center along State Route 3 on Merritt Island, some of the orange groves huddled under blankets of smoke from large bonfires created to help protect the fruit from freezing. Most of the large groves had been flooded or sprayed with water. The temperature of fruit encased with ice does not drop below freezing. Smudge pots were no longer used due to pollution. The air temperature was in the low thirties and dropping rapidly into the twenties. The smaller grove owners could not afford to protect their groves, and a week later their oranges would be thudding to the ground at the rate of a dozen per minute. The officers at the first guard gate wore heavy jackets. “Do you think it will go, Mr. Harris?” one asked. In capitulation to the freezing cold, the press site looked pretty deserted when I arrived. Normally, the photographers and reporters would be walking between buildings or gathered in little groups for a smoke. This morning they were all indoors. There were fewer press representatives than normal, as well. The shuttle launches had become routine through the years. About five hundred media had been accredited for Challenger—as opposed to five times that number for STS-1. As I recall, only one of the major networks was covering the launch live. The twelve-acre press site is located at the Banana River Turn Basin, slightly more than three miles from the launch pads. During the Apollo program, barges bringing the rocket stages from Michoud Assembly Facility, just outside of New Orleans, unloaded at the turn basin; now it was the shuttles’ external tanks that were unloaded there. It is just across the road from the Vehicle Assembly Building (VAB), where the Solid Rocket Boosters (SRB), external tanks, and orbiters were bolted together on a mobile launch platform before being taken to one of the two launch pads, designated Pads 39 A and 39 B. The Challenger launch was taking place from 39 B. A three- to four-acre, six-foot-high mound had been built along the back of the press site with material dredged up to deepen the turn basin. On top was a 350-seat grandstand fitted with long counters, telephone hookups, and folding chairs, as well as several permanent structures put up by NASA, the major television networks, and the wire services. Another half-dozen office trailers had been brought in by Florida Today, the Orlando Sentinel, the Nikon camera company, and others were split between the mound and the lower level. The public information office, my home away from home, was located at the press site in a geodesic dome originally bought for the United States Bicentennial Exposition. It also provided working space for media who didn’t have their own facilities. KSC office spaces lined one inner wall of the dome; along the other were several rows of long, counter-like desks for the press with assigned spaces where they could order temporary phone hookups. There were bins for fact sheets and news releases and a bank of pay phones. A waist-high counter separated the press from the information people and provided space for the press to ask questions. Members of the press were not allowed behind the counter unless they were invited in for an interview or other business. The flags of the sixteen countries that were partners with the United States for the Spacelab missions and for the future International Space Station flew over the press area. Down below the mound were several acres of grass and the large, iconic countdown clock at the water’s edge. Many news photographers had used the countdown clock in the foreground of pictures of previous launches. Thousands more posed with it as proof that they had covered history. For each launch, temporary grandstands were trucked in to accommodate about a thousand VIP visitors. These included the extended families of the astronauts who were flying and guests invited by NASA headquarters or other centers. The immediate families of the astronauts and special guests, such as members of Congress, would watch from the roof of the Launch Control Center. Approximately twenty thousand other invited guests would be taken by bus or given car passes to park on the causeway across the Banana River connecting KSC and the Cape Canaveral Air Force Station about seven miles from the pads. Loudspeakers set up in each location allowed my commentary to keep them informed about what was happening. Public affairs representatives and car parkers at each location helped direct them and answer questions. I reached the press site about eight hours before the then-scheduled launch time of 10:38 a.m. and went into my office after checking with the staff and saying hello to the press who had come in early. Almost everyone commented on the cold and speculated that we would postpone the launch for a third time. The launch scheduled for two days earlier had been canceled because of the weather forecast. It turned out to be a perfect day. The attempt of the previous day, January 27, had been scrubbed because sensors showed that the crew ingress door on the Challenger was not securely closed. Once that was corrected, the handle used to latch the door could not be removed without drilling out the bolts. Time ran out, and crosswinds at the shuttle landing facility became unacceptable. Finally we were at January 28. The day had everything going for it in terms of weather, except the bitter cold. The first person I called was information specialist Andrea Shea King, who was in the firing room, keeping the press informed on the progress of loading liquid hydrogen and oxygen. “What are you hearing on the OIS?” I asked, referring to the Operational Intercom System, which tied all elements of the launch team together on more than thirty voice circuits.